After being named the farm system with the best pitching prospects, the Braves got a chance to showcase all that talent this season. With a focus on promoting young players early, the Braves had Kolby Allard, Mike Soroka and Max Fried skip Class A Advanced Florida and settle in quite well at Double-A Mississippi. Luiz Gohara progressed from the Florida State League to the Majors, while Fried and Lucas Sims joined him in Atlanta as the talent began to reach the highest level. Of course, the Braves also brought the bats, with Ronald Acuna breaking out and Ozzie Albies ascending to the big leagues. "What has happened in the last few years is we've had a real stockpiling of young talent," Braves director of player development Dave Trembley said. "We've had a lot of movement in guys coming up through the system, which I think bodes well for the future of the Braves." Catcher -- Alex Jackson, Florida (66 games), Mississippi (30 games): After picking up Jackson in a trade with the Mariners, the Braves asked the 2014 first-round pick to move behind the plate for the first time since high school. There proved to be an adjustment period defensively, but Jackson had one of his best seasons offensively. The 21-year-old recorded career highs with 19 homers and 65 RBIs while hitting .267, his best non-complex average. "He has the ability to hit with power, great size," Trembley said. "We think he's going to be a guy that's going to be an everyday catcher at the Major League level, and he really had a solid season for us." First baseman -- Joey Meneses, Mississippi (108 games): Last season, Meneses got a taste of the Southern League before heading to Mexico for Winter Ball. Trembley believes playing in his home country was a big boost for the 25-year-old, who excelled in 2017. Making a lot of strides this year, Meneses hit .292 and posted a career-best .360 on-base percentage. The right-handed hitter also drilled a personal-best nine jacks for Mississippi. Second baseman -- Ozzie Albies, Gwinnett (97 games), Atlanta (51 games): Albies proved age is nothing but a number. The 20-year-old began the season as one of the youngest players in Triple-A and ended it as one of the youngest players in the Majors. Making the move from shortstop to work in tandem with Dansby Swanson in Atlanta, Albies showed versatility and created an exciting double play combination for Trembley and Braves fans alike. "He has quickness, very good defender, plus arm, hit from both sides, has played very well at the Major League level," Trembley said. "He's a baseball player and a very good one. He's a catalyst, he's a very good defender, a plus runner, switch-hitter. I think he's a top of the order type guy." Albies also notched a career-high nine long balls with Gwinnett and flashed his 70-grade speed with 21 stolen bases in 23 tries in the Minors this year. Honorable mention: In his first full season, Alay Lago led the Florida State League with a .303 average. Third baseman -- Austin Riley, Florida (81 games), Mississippi (48 games): While Riley's numbers in the pitcher-friendly Florida State League weren't mindblowing -- .252/.310/.408 -- the Braves could tell he was a second-half player and would be ready for a promotion. And it paid off. The 2015 first-round pick hit .315/.389/.511 for the M-Braves and finished third in third in the system with 20 homers and 74 RBIs. "I could compare Riley to [Scott] Rolen at the same stage of their development. A real blue collar-type player, a real grit, determination, great worker, doesn't get too high, too low, but comes to play," Trembley said. "If he stays healthy, he's going to be the everyday third baseman for the Braves for a long time." Shortstop -- Sean Kazmar, Gwinnett (99 games): Kazmar enjoyed a resurgence with the G-Braves. The 33-year-old drilled double-digit (11) homers for the first time since 2007 while putting up a .284/.310/.416 slash line. Trembley said Kazmar reminds him of longtime big league infielder John McDonald. "A manager's player, a team player, which is when you say those things about a player, especially today, it's probably one of the highest compliments you can give them," Trembley said. "I think he gets everything out of his ability all the time." 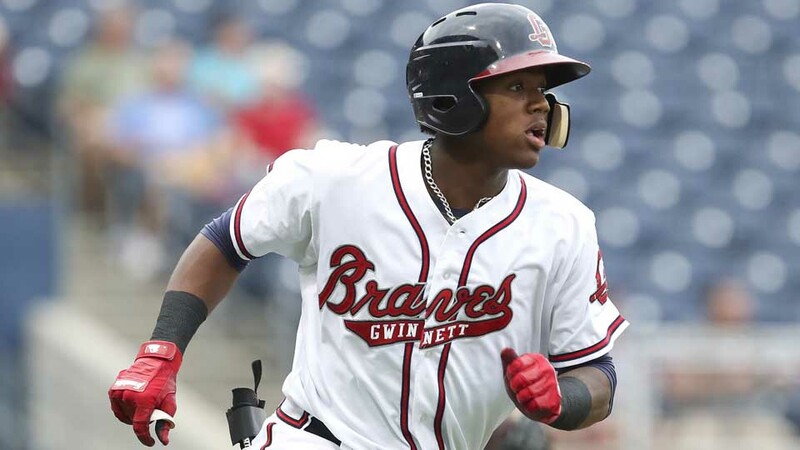 Ronald Acuna, Florida (28 games), Mississippi (57 games), Gwinnett (54 games): To say Acuna had a breakout season would be an understatement. Leading the organization with a .325 average, 82 RBIs and 44 stolen bases, plus tying Carlos Franco for the top spot with 21 homers, he jumped from the Braves' No. 18 prospect last year to their top prospect and MLB.com's No. 5 overall. "Acuna is a player who only comes around every once in a while," Trembley said of the 19-year-old. "For a young man who doesn't have a lot of experience in professional baseball, his biggest attribute is he knows the strike zone; he doesn't get himself out. "Ronny is a special player, great attitude, represents himself as you would want someone to represent himself. He is not a selfish player, he doesn't flaunt it. He has time for people, he knows he's still learning." In the Arizona Fall League, Acuna will focus on being more selective on the basepaths (he was caught 20 times in 64 tries this year) while working the count and fine-tuning his positioning in the outfield. Xavier Avery, Gwinnett (121 games): After being in the Orioles system when the team drafted Avery in 2008, Trembley was reunited with the Atlanta native when the Braves signed him in March. Avery asked what he needed to work on in the International League and Trembley replied with power, defense and baserunning. "He improved all three," Trembley said. Avery slugged a career-high 14 roundtrippers while plating 52 runs and stealing 21 bases in 28 attempts -- his best mark since 2014. Patrolling all three outfield positions, the 27-year-old committed seven errors in 101 games. Cristian Pache, Rome (119 games): Pache made his full-season debut at the age of 18, hitting .281/.335/.343 with Class A Rome. The native of the Dominican Republic ranked second in the system with 32 steals in 46 tries as he showcased his well above-average speed. Making six errors in 118 games, Pache's defensive runs saved stats "were off the chart," Trembley said. "He doesn't have the bat of Acuna, but he has the tools. He can run, throw, defend, his makeup is unbelievable," he added. "He's a tremendous outfielder, fearless on the bases. We're going to work with him on his hitting, driving the ball a little bit more. We think the power will come a little later as he plays a little bit more." Utility -- Carlos Franco, Mississippi (41 games), Gwinnett (93 games): After the Braves told him to be more aggressive at the plate, Franco put up career numbers. The left-handed hitter notched personal bests of 21 long balls (tying Acuna), 77 RBIs, 116 hits and a .427 slugging percentage as he reached Triple-A for the first time in his nine-year career. Splitting time between first base and third, Franco totaled 10 errors -- his lowest count since 2011 in Rookie ball. "When he gets his pitch to hit, he hits it," Trembley said. "And because he can play first and third and he's got power and he's a left-handed hitter, I think he's a valuable commodity for a National League club." Right-handed starting pitcher -- Bryse Wilson, Rome (26 games): In a system that boasted many talented pitching prospects, the 2016 fourth-round pick shined bright. The 19-year-old led the organization with a 2.50 ERA, notching 139 strikeouts against 37 walks over 137 innings while going 10-7 in his full-season debut. "Power stuff, sinker, slider, athletic," Trembley said. "We're going to keep starting him. He misses bats, he improved because he came up with the third pitch -- the changeup -- to neutralize left-handed hitters." Left-handed starting pitcher -- Joey Wentz, Rome (26 games): Another 19-year-old out of high school, Wentz displayed his above-average fastball. The 2016 first-rounder ranked second in the system with a 2.60 ERA and third with 152 punchouts. After compiling a 3.30 ERA in the first half of the season, Wentz lowered it to 2.01 in his final 13 starts. In total, the Braves' eighth-ranked prospect went 8-3 with 46 walks and a 1.10 WHIP over 131 2/3 innings. "Very competitive. Really tightened up his breaking ball from the half-season a year before in [Rookie-level] Danville," Trembley said. "I compare Wentz to Alex Wood: a little bit younger but same kind of stuff, same kind of makeup, same kind of poise. Gonna pitch in the big leagues." Honorable Mention: Touki Toussaint led the system with 167 strikeouts across two levels. Relief pitcher -- Thomas Burrows, Rome (38 games): Following those two dominant starters, South Atlantic League batters had to face Burrows in the later innings. After being acquired from the Mariners in January, the 2016 fourth-round pick posted a 2.16 ERA with 92 strikeouts, 25 walks and just one homer allowed over 66 2/3 innings. "Slider, sinker, looks like he could be a matchup guy. Reminds me of another guy we had here earlier that we traded, pitching out of the bullpen for the Yankees, Chasen Shreve," Trembley said. "He throws strikes, he does not pitch behind and he keeps the ball on the ground."